Street food has found its way to Las Vegas. Restaurant veterans have hit the road, literally, to deliver their unique bites to the masses across the valley. With more than a dozen gourmet food trucks in service, chances are there is currently one in a parking lot near you. To find these rolling conveyors of cuisine, followers rely on the truck’s websites or social sites like Facebook and Twitter to track down the brigade. For some, the chase is just as much of a thrill as sinking your teeth into that delicious bite. Others keep busy schedules and can never find the time to play the cat and mouse game. 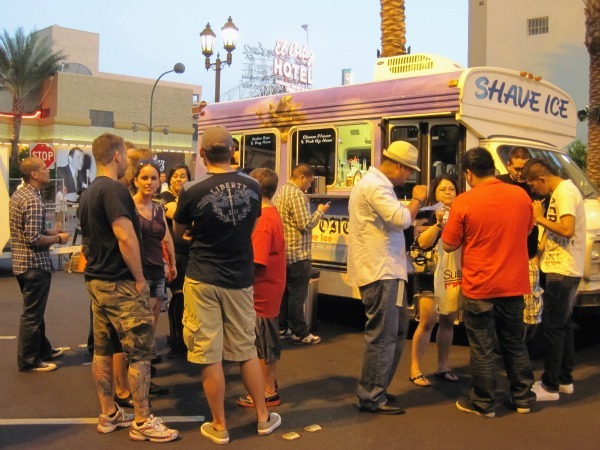 Fortunately, the food truck craze has given way to a new monthly food and music festival hosted by the El Cortez called Vegas StrEATS. This event allows area food trucks to gather and draw hungry crowds who come to fill up on tasty eats and refreshing drinks. Then, they stay to enjoy local artists and bands. StrEATS is held the second Saturday of every month, 6pm-2am and admission is free. The next festival will be June 11, 2011. Slidin’ Thru was a pioneer cruiser. They have garnered great success with their Angus beef sliders. My favorite is the Barby which is melted cheddar, caramelized jalapeno, crispy fried onion strips, bacon and barbeque sauce. You don’t have to be a vegetarian to enjoy the Eggplant Caprese of grilled eggplant, tomato, basil, fresh mozzarella and balsamic reduction. Cost: One slider is $3, two for $5 and three for $7. 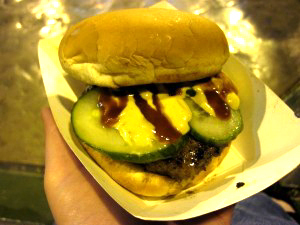 Fukuburger quickly followed in Slidin’ Thru’s tracks with their own burger truck with Asian flair. These little patties are flavored with items such as pickled ginger, miso-glazed bacon, wasabi mayo, furikake and teriyaki. It’s the Karai Burger I enjoy, it is stacked with cucumber, avocado cream, spicy mayo and habanero kabayaki sauce. The Tamago Burger is also a crowd pleaser, it’s an egg over easy, seasoned with furikake, onion strings, and teriyaki sauce. Cost: $5 per burger. Lulu’s on the Move switches things up a bit by being the only gourmet pastry truck. Backed by Bouchon’s former pastry chef, Lulu’s offers an assortment of artisan baked goods. Savory bites include pork sandwiches and unusual sides. The Eggplant Grilled Cheese won me over, with gooey cheese sautéed onions and eggplant, fresh basil on artisan bread it’s hard to go wrong. Cost: Items range from $1-$6. Sloppi Jo’s offers some real treats, but don’t come expecting sloppy jo loose meat sandwiches. The truck is instead name for its owner, Jo, who worked for Commander’s Palace in New Orleans. Her menu showcases her passion for Hatch New Mexico green chiles. You can expect stews, cheeseburgers, and tacos. The Sloppi Jo is likely most popular, slow roasted pork with red chile sauce is topped with a fried egg and pickled onions and served with a warm tortilla. For me? I love the Crispy BBQ Pork Loin sandwich. Cost: Items range from $3-$8. The next Vegas StrEATS will have local artists and vendors on hand, including boutiques such as Pharmacy, Suite 160, KNYEW, and HippoEsthetics . Don’t miss the live art wall and be sure to check out the live music, as well. The next festival’s line up includes Air Stegosaurus, Left Ginsberg, DJ Spair, DJ Scientific, DJ Zo and DJ 19Sixty. Update: December, 2015. As we all know, food truck cuisine is an ever-growing phenomena in Las Vegas and around the country. Here’s another one to seek out when you are in the mood for some quality BBQ — Sin City Trucks. This is something I was not aware of — I’ll certainly check out the festival on the 11th!